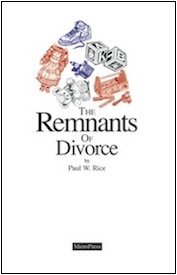 The Remnants of Divorce is a non-clinical approach to the effects of divorce on the average American family. Paul is joined in this effort by four of his adult daughters from two of his ex-wives. They each have their own chapter in the book. This is a great eye opener on how a divorce can cause disastrous effects on children into their adult years and then on their offspring. Read and then perhaps, reconsider.